Bring a skillet sprayed with nonstick spray to medium-high heat. Add beef, onion, and 1/4 tsp. each garlic powder and onion powder. Cook and crumble for about 5 minutes, until beef is fully cooked and onion has softened. Remove skillet from heat. Stir in 1 tbsp. BBQ sauce. Add beef mixture to the large bowl. Drizzle with remaining 1 tbsp. BBQ sauce, and top with tomato. Chop or crumble bacon, and sprinkle over the bowl. 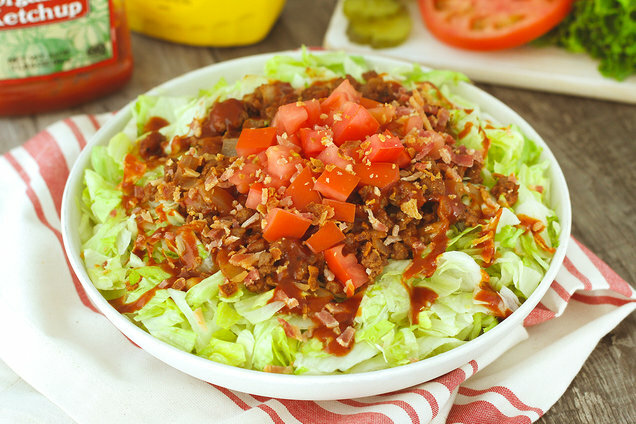 Hungry for More Lower-Carb Burger Recipes? 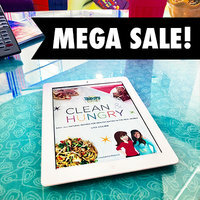 HUGE NEWS: Get Hungry Girl Clean & Hungry eBook Edition for Just $2.99! ... all under 375 calories! Get the Amazon Kindle version here! Get the Barnes & Noble Nook version here! Get the Kobu version here! Get the Apple iBook version here! Get the Google version here! Order yours STAT. And FYI: You don’t even need a special device to read the ebook... Most ebook readers have a free app! Get cookin’! FYI: We may receive compensation from some of these links. It's National Cheeseburger Day, September 18th! You need these Too-Cute Cheeseburger Bites RIGHT NOW. Share all the easy-recipe fun -- click "Send to a Friend" now.